Summer: fresh beans season, time to sit on a porch overlooking the sea with a bag of full pods on one side and a bowl on your knees. 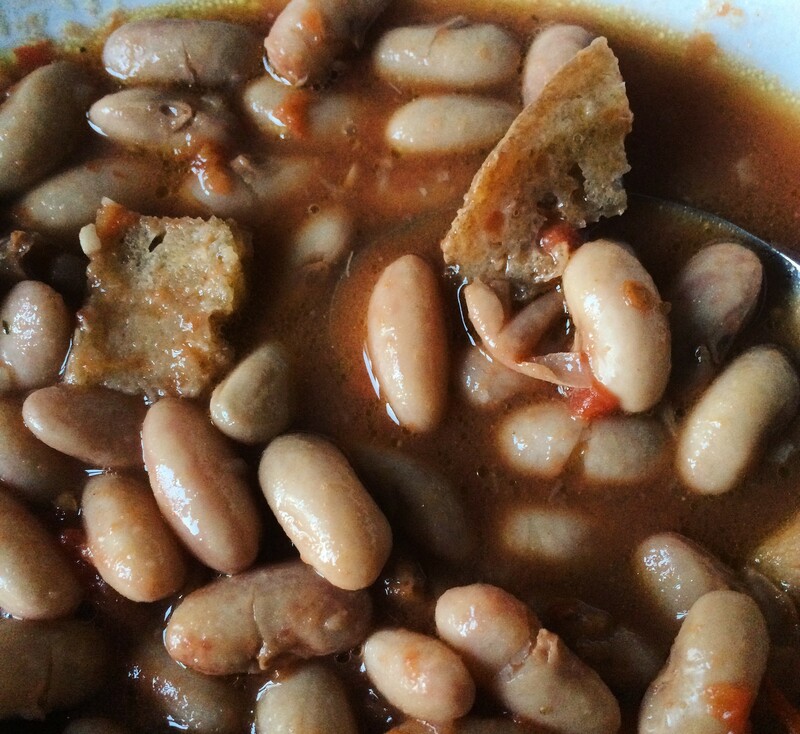 If you (like me) don’t have a sea view nor a porch on hand, go buy some fresh beans and find some consolation in fagioli alla maruzzara, a very simple and fulfilling recipe from the most traditional repertoire of Neapolitan cuisine. 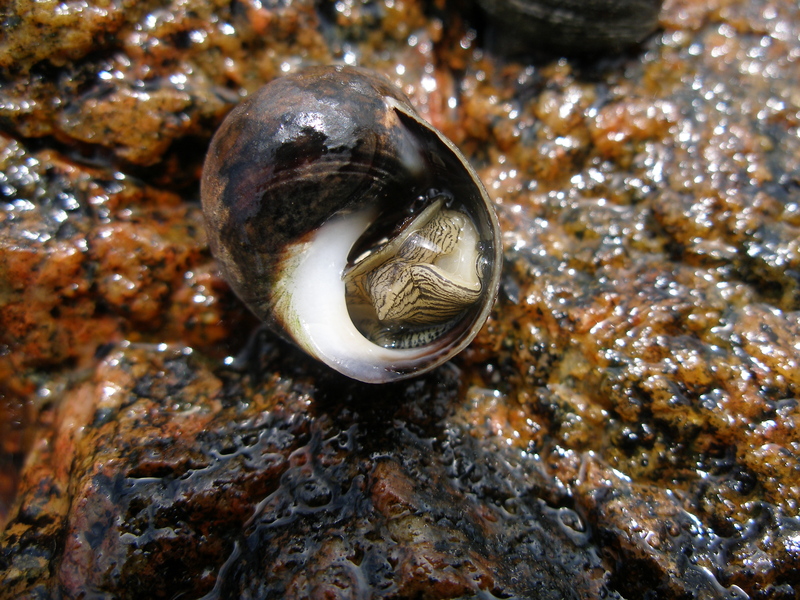 snail eaten as seafood, as it is prepared exactly the same way: with celery, tomato, garlic and toasted or dried bread. The beans-based version is believed to be a traditional food for fishermen during their fishing missions. It was a rich and nourishing dish, cheap and easy to cook aboard a small fishing boat. 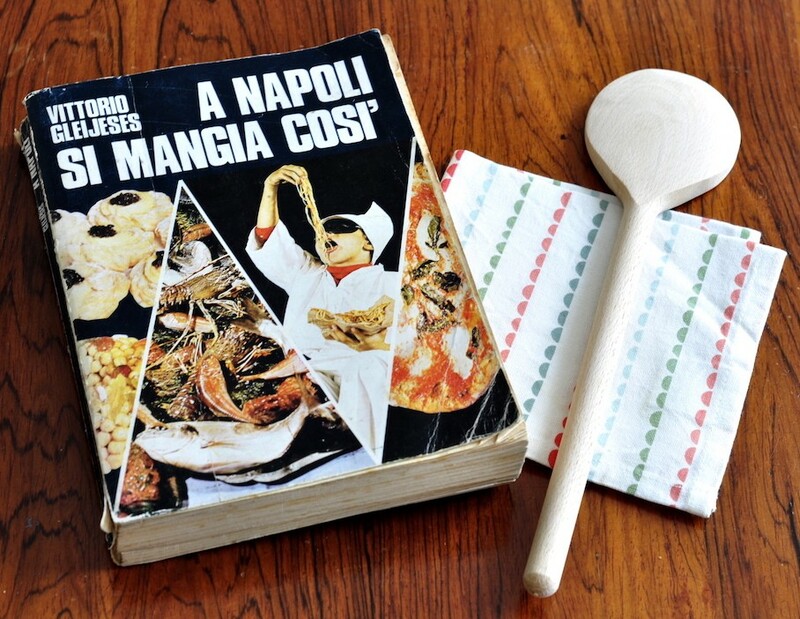 When it comes to Neapolitan classic recipes, my infallible sources are my grandma and a 1977 edition of “A Napoli si mangia cosí” [“That’s how they eat in Naples”] that used to belong to my mother. The recipe book was a present from my father when they were still engaged and she entrusted it to me as an acknowledgment of my (alleged) culinary flair. I keep it as a sacred relic and handle it with the maximum care, as time didn’t go easy on the volume. Despite its yellowing pages coming apart, this cookbook written by the Neapolitan journalist and historian Vittorio Gleijsies still contains a lot of valuable knowledge, besides a few drawings and a mother’s day card from my kindergarten times. 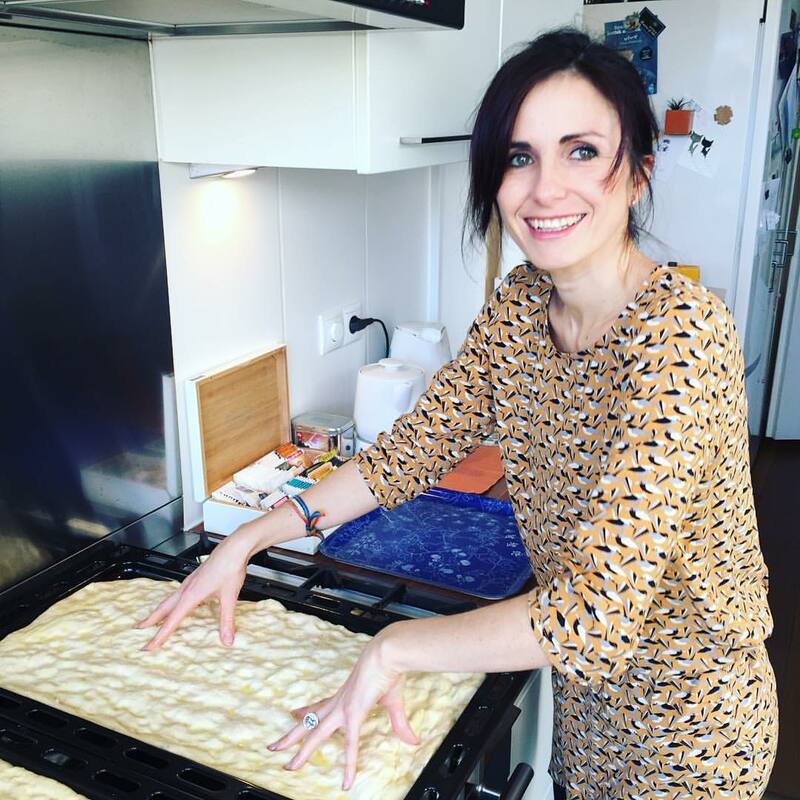 The recipe I am presenting is a mash-up of that from the book, my nonna‘s and my own tricks. The instructions to make fagioli alla maruzzara are the same whether you use fresh or dried beans, only the cooking time differs. Of course you can use canned beans as well, but they are often overcooked and the final result won’t be as neat, not to mention the difference in taste and nutritiousness. Needless to say, if you are lucky enough to find fresh beans, just go for them! If you can’t find any good and tasty fresh cherry tomatoes, you can replace them with canned ones or even pelati. Just try not to add the tomato sauce that comes with them. Speaking of replacements, I was out of celery last time, so I used minced celeriac instead. The taste is slightly more intense, but very close to the classic one. 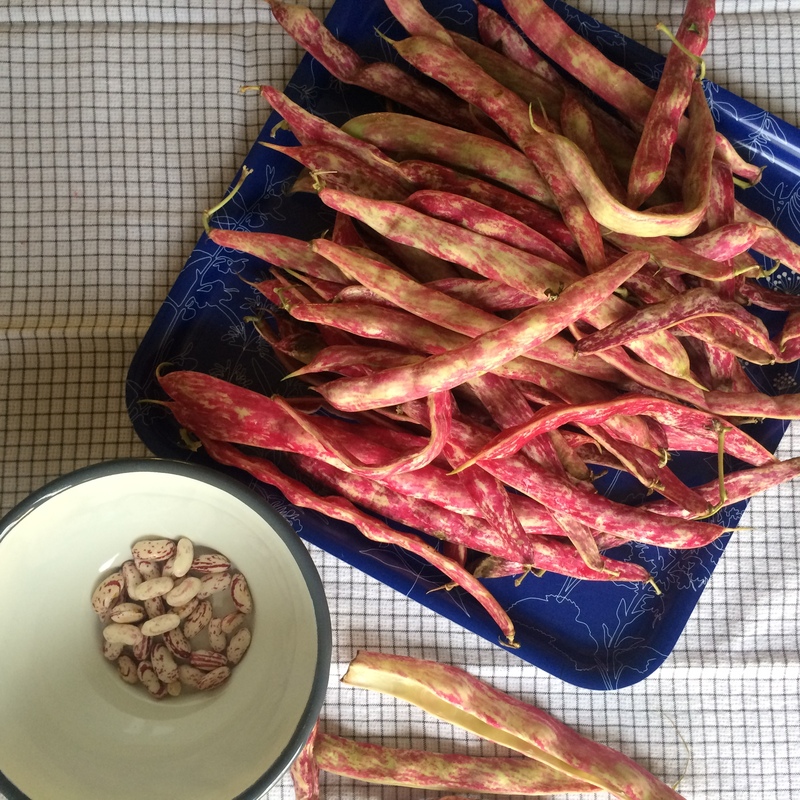 I used borlotti beans – I was delighted to find fresh ones during my groceries, but cannellini beans are just as suitable. Fagioli alla maruzzara – Ingredients and method (serves 4). One of the little pleasures in life: shelling beans. Shelling time: as long as you need to enjoy the meditative effect. Recommended soundtrack: Maruzzella, by Renato Carosone, 1954 *. Total cooking time: about 1 hour. Place the beans in a wide pot, cover them with water by a couple of centimetres and take it to the boil. Simmer gently until they become soft without disintegrating. The cooking time may vary depending on the quality and size of your beans; normally they should be ready in about 30 minutes. In case the water evaporates below the beans level, gradually add more boiling water and never (ever) add salt before the beans are completely cooked. Chop the celery into thin pieces, heat some oil in a separate pan (big enough to contain the beans), and let the celery fry gently, together with the crushed garlic cloves. I prefer saving most of the olive oil for later, to use it raw as a topping rather than overcooking it. Of course, this pays back, in terms of flavour and digestibility, especially if you care for good quality extra virgin olive oil as I do. When the garlic is sautéed, add the cherry tomatoes and put the lid on. I like to keep them whole until the inside is cooked and are easily crushed by applying a gentle pressure with a wooden spoon. I believe the taste stays fresher and richer this way. When the tomatoes are soft enough to be crushed open, remove the lid and let them cook for 5 to 10 more minutes. Add the beans, and their cooking water to taste: the final result can be more or less watery, it’s really up to you. My suggestion is to use just enough cooking water to cover the beans, at first, and add some more after 5 minutes, if the mix becomes too dry. It’s a soup, after all! Add salt and let it cook for about 15 minutes on a gentle fire. You can serve the soup warm or just lukewarm, depending on the weather. It’s normally accompanied by stale bread, but to make it even tastier you can dice a couple of slices of good rustic bread (I used my homemade sourdough bread) and bake it in a pan with olive oil, put it in the serving plates before pouring the soup on top of it. Add oregano and pepper to taste. *) – Maruzzella [little sea snail] in Neapolitan dialect is also a nickname for a perky young girl. The song was a hit in the 50s and quickly became a standard in Neapolitan music. The track is featured in Martin Scorsese’s 1973 Mean Streets and in John Turturro’s 2010 Passione. Previous PostGragnano: Made For Pasta. Next PostPizza Fritta, The Fried Gold Of Naples.